It’s soft. It’s warm. I like it. MAXIMUM COMFORT: Extra soft velvet blanket perfect for beds, couches, camping, chilly movie theaters or traveling! EXTRA SOFT & COZY: Our carefully crafted Microplush Blanket is so sublimely soft and lush, it will be hard to get out of bed in the morning! Made with our exclusive premium microfleece yarns, you'll want to have one for every bed and chair in your house so you can lounge in luxury and comfort. SUPERIOR HYPOALLERGENIC MICROFLEECE: The skin is the largest organ in the body so treat it right with our Cozy Ultra-Soft Microplush blanket. Featuring a velvety, fuzzy feel that is soft to the touch, our blanket is anti-pilling, wrinkle free, hypoallergenic, and does not shed. Great for those prone to allergies and asthma! 1 microplush blanket 50" x 60"
1 microplush blanket 62" x 92"
1 microplush blanket 90" x 90"
1 microplush blanket 108" x 90"
This has to be one of our new favorite blankets. My daughter who sleeps in a twin, loves greens and blue and all things soft (she is very sensory sensitive) We thought this would be a great bed blanket for her so decided to give this great Ive Union Microplush Super Soft blanket and go with the emerald color. This is the best blanket we currently own. I'm not sure it's even going to make it on my kids bed. First of all, this is pretty big. Even much bigger than a standard Twin. It says 'twin XL' and it would surely work as a throw for a full size bed too (in my opinion.) The color almost has a double color to it; in the light, it looks whiter and when you move it, its darker. It's a very nice teal color. The stitching is well secured and sewn. And the material feels premium grade. It is the softest blanket I have ever felt in my entire life. It's thick and warm without being too much of a sauna. It comes in a standard plastic zippered bag. And not to mention for the product you are receiving it's a great price and value. I'm very pleased with this blanket and can't say enough good about it. I am always wanting to feel cozy on chilly nights so I went ahead and ordered this Leopard Microplush Super Soft Blanket by Ivy Union. After testing it out this are my findings: PROS: * This blanket has a really amazing texture. It is like butter-soft! Plus I can tell that it is highly durable. * I like the craftmanship on it. It's well made and stitched properly. * This blanket comes in a cool leopard print, totally my style. There are other print or color options. * It is so nice and warm that I want one on every single bed in the house once the temperature drops. * The material is light, with a feel reminiscent to velvet. * The plush feel not only adds style but also a super soft level of comfort. * This microplush blanket is machine washable therefore ensuring that it is easy to maintain. * This blanket is also resistant to stains and mildew. * The colors on microplush material will not run. CONS: * I would like it to be winter all year. I don't want to put it away. Overall this Leopard Microplush Blanket is luxurious and great for extra warmth and softness. It is going to feel great while sitting on the couch, watching tv and drinking hot chocolate on a winter night. I like it a lot! I received this product at a promotional price in exchange for my honest and unbiased review. This opinions are my own and might be different from yours. This blanket has vibrant colors and the leopard pattern looks good on both the front and the back. The back is more muted but still looks great! All the stitching is sewn well. There are no lose threads. This blanket is super soft, even the hem is soft! I ordered the Leopard pattern and am using it on the end of our King size bed. It works great as a cover up when taking naps, as extra covering for out feet or to pull up on chilly nights. This blanket goes great with my gold duvet cover and dark brown sheet! The spots in the pattern are black and brown on a light golden background. It folds nicely when not in use and is very light. It is great for traveling since it does not take up much space. I appreciate how easy this blanket is to care for. It can be machine washed and tumble dried on low or hung to dry. I launder it the same way I do my other bedding. I tumble dry for a little while but let it finish drying hanging up. This blanket arrived in pristine condition in a clear bag. It has exceeded my expectations in comfort and softness! This blanket is so soft and plush its like curling up with a big warm teddy bear. The Twin XL size fits the twin bed in my guest room perfectly with room to spare so you can roll up in it and sleep comfortably. The blanket really keeps you warm too. Sometimes when I'm watching a movie or wanting to nap on the couch I'll go grab it and curl up in it. The blanket is well made and has the folded over and then stitched edges so there's no fraying or rolling up on the edges, I used to own a blanket similar to this a while ago and I made the mistake of washing it and putting it in a hot dryer. This melted the blanket and made it hard and stiff and pretty much ruined the softness of it. So please pay attention to the washing instructions on this blanket and hang it up to dry. That way it'll stay nice and soft and plush like when you first received it. I received this product in exchange for my honest and unbiased review. This is an extremely plush blanket with hemmed edges. The blanket is a very large twin size (XL Twin, to be exact) and has a bold leopard print with an overall tan color and dashes of black and brown. The print is very intense throughout the entire blanket. The edges have a secured hem with reinforced stitching that doesn't have any skips or loose threads. This blanket easily fits a twin size bed with plenty of drop on each side, and even covers the top of a full size bed. I am in love with this blanket. The level of softness is unparalleled and is so comfortable to curl up in while reading a book. I ordered the leopard print because I was looking for a throw blanket that would cover a good portion of our living room couch, yet still blend with decor. The leopard print is bold and dynamic and goes great with my massive framed lioness print on the wall right above the couch. Even my youngest (two year old daughter) is enjoying this blanket and I have to constantly replace the blanket back on the couch due to her toddling off with it wrapped around herself. SOFTEST blanket EVER!!!! It is a LIGHT blanket, NOT thick but this does not mean not good quality. It's perfect for me. I love fleece because it is so soft and own multiple fleece "sweatshirts" and blankets. This is so soft my cat hopped up to investigate the new item and immediately began kneading it~ and she is fussy, she only kneads the softest things. It's like being surrounded by a cloud. SOOOOOOO SOFT!!!!! If you want soft, this is the blanket for you. I also bought a twin as a throw so its big enough to share with everyone-because as I watch tv surrounded by this heavenly softness they touch it, they said "oh it's so soft!!! Can I join you?" If you are looking for SOFT, BUY THIS! Also another VERY SOFT FLEECE blanket is the Superior Ultra Soft Fleece Blanket- that one also is as SOFT as a CLOUD! BOTH are EXCELLENT soft fleece blankets! We needed some new blankets, so I ordered 1 Twin, 2 Kings, and 2 Throws of this Microplush Bed Blanket. The colors are pretty, and the blankets are so soft! These blankets are quite light. I expected something a little thicker, but with a sheet underneath them they are working out really good. I would recommend them. I was looking for a blanket that was light weight and not bulky, this blanket is perfect. I like the soft feel of the microplush bed blanket. It keeps me warm without feeling heavy on my body and is a good value. I would definitely recommend this blanket to a friend. Premium-Luxury-Ultra-Soft-Microplush-Bed-Blankett is soft and cuddly. I love the deep black it looks like black velvet. My only complaint is that it is not as wide as I thought it would be. 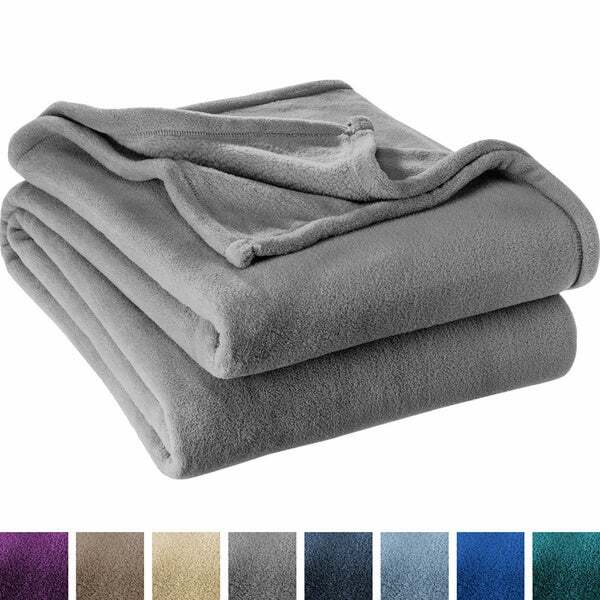 This a good blanket for the price.I am happy with its warmth and softness. I want one for all the beds in the house! So soft! Super soft. Light weight. I got the darker grey. Its a great couch blanket or if u want something light for warm summer night!!! Great quality! We love it! They were very soft and the dark blue was the perfect color, but WOW they shred horribly. I do not know if they will shed after laundering, but I don't want to risk it because if I wash and dry them, I will be unable to return them. Unfortunately, they have to go back. Love these blankets. This is the second one I have purchased. Wash well, soft, and cozy. Beautiful, plush and warm without weight. Washes perfectly and comes out looking new. I have one of these blankets on every bed with two extras. This is too soft for words - somehow it is both lightweight and substantial. I find myself petting it - soooo relaxing! "Is this blanket oversized? My bed is 100x 92." The King size blanket would fit. "is this blanket machine washable and dryable? What is it made of and does it pill?" Yes it is machine washable and dry-able. It is made of micro-plush fleece polyester. It will not pill. "What are dimensions of twin xl"
"Is the emerald more dark green or dark Aqua?" I'm sorry. I bought it last August for my daughter's dorm room and haven't seen it since. Style, material, color and price.